Analysis: Could Surname Be Key in Republican Supreme Court Race? Do Republican voters in Texas have an aversion to Hispanic names? Texas Supreme Court Justice Eva Guzman is hoping that bit of election folklore is untrue. 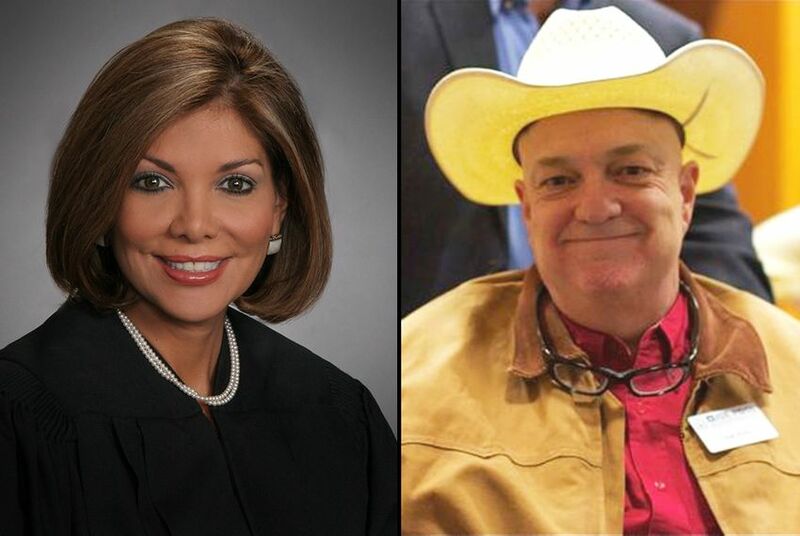 Texas Supreme Court Justice Eva Guzman (left) is being challenged by Joe Pool Jr. in a Republican matchup for Place 9. What’s the deal with Texas Republican primary voters and candidates with Hispanic names? This question comes around every two years — usually as part of an election autopsy exploring why a particular candidate lost. The question describes risk more than it describes certainty: Sometimes, it does not apply at all; sometimes, the difference in names seems to be the only reason for an election to come out the way it did. It’s a risk for Texas Supreme Court Justice Eva Guzman, who finds herself in a Republican primary against Joe Pool Jr. of Dallas, who has unsuccessfully tried to get on the court two times before this year. For one thing, that means he’s been on the state ballot one more time than the incumbent. Guzman was appointed by then-Gov. Rick Perry in 2009 and ran for a full six-year term the next year. She beat Rose Vela by a nearly two-to-one margin in the Republican primary and went on to win 60.4 percent in the general election against a Democrat and a Libertarian. This time, Guzman is on the Republican ballot with Pool and no other challengers. She, like just about every judge in Texas who hasn’t been in enough trouble to get attention, is virtually unknown. Pool is unknown, too, unless you’re old enough to remember his father, the late congressman from North Texas, or you know about the Dallas-area lake named after Joe Pool Sr.
Guzman has virtually all of the institutional support. The business and legal trade groups that have weighed in have weighed in on her side, as have a slew of public officials, including U.S. Sen. John Cornyn, Gov. Greg Abbott, Lt. Gov. Dan Patrick, several former Supreme Court justices, and — importantly in an election year when the GOP’s factions are often split — social conservatives like the Eagle Forum’s Cathie Adams and David Barton of WallBuilders. Most voters don’t know enough about all of that to decide whether it matters to them. They’ll know the candidates at the top of the ballot and not the ones in the races that have received less publicity. That’s always true, but it arguably matters more in low-information races where the only cues voters have are the names of the people they’re voting on. Ted Cruz, Hispanic surname and all, won a crowded Republican primary for U.S. Senate against three white guys in 2012. His name was no impediment. But he was also in a top-of-the-ballot, headline-generating brawl with a sitting lieutenant governor. Voters were well aware of who was who in that contest. That’s rarely the case in races for the state’s two high courts, or for executive branch positions that aren’t at the top of the ballot. Pool ran for the Texas Supreme Court in each of the last two elections. In 2014, Jeff Brown walloped him 71.9 percent to 28.1 percent and then won the general election to win a full term on the high court. In 2012, Pool was one of two candidates — the other was John Devine — who challenged sitting Justice David Medina. Pool finished third. Devine beat Medina — maybe it was a name thing, maybe it wasn’t — in the runoff in July of that year. Like every other Republican on that year’s statewide ballot, Devine prevailed in the general election and he, like Brown, is now on the court. Medina had other problems — questions about a fire that destroyed his home in 2007 resulted in a short-lived indictment against the judge’s wife — and his name was far from the only factor in that contest. Pick a side: The names sometimes cited as victims of a bias against Hispanic surnames include Xavier Rodriguez, who was knocked off the Supreme Court in 2002 by Steven Wayne Smith, and Tony Garza, who lost a 1994 primary for attorney general in spite of some strong establishment support. On the other hand, several Hispanic Republicans have done just fine in the face of the same challenge, like state Reps. Larry Gonzales of Round Rock, Jason Villalba of Dallas and J.M. Lozano of Kingsville. And Garza, to argue it the other way, did win a 1998 primary for the Texas Railroad Commission against Steve Stockman. Porter called that “sour grapes” and said “anti-incumbency fever” was probably a more accurate reason for the outcome. Guzman’s supporters worry that Carrillo was the better analyst.